When will UCPath go live? UCPath is the largest initiative of its kind in UC history. 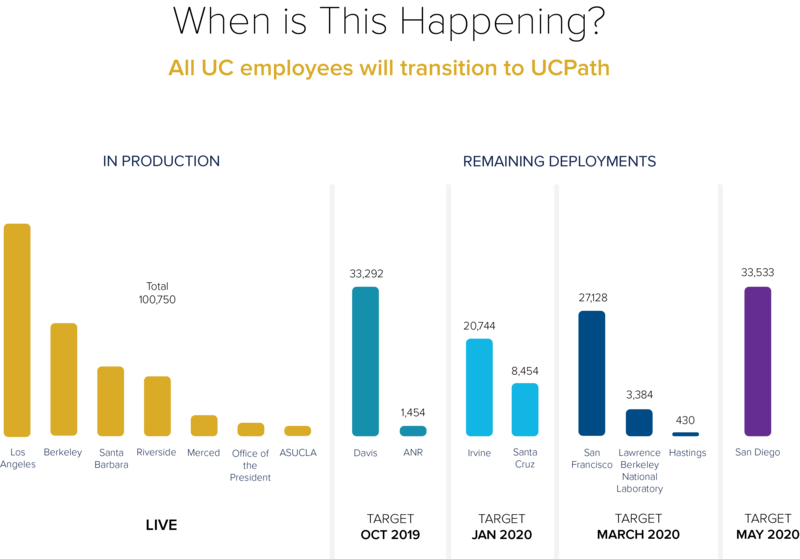 Data for more than 200,000 employees across 20 locations will be transitioned into the new UCPath system. Each campus has a large volume of complex data that must be moved from local payroll and personnel systems into the UCPath system. With so many staff, faculty and student employees and unique systems, the project is being completed in phases that allow the UCPath team to focus on smaller deployment groups. UC Davis and UC Davis Health are expected to transition to UCPath in 2019. We follow the successful deployments at Los Angeles, Santa Barbara, Office of the President, Merced, Riverside and Associated Students UCLA – all now live on UCPath. For the latest deployment updates, visit http://ucpathproject.ucop.edu/.